Since 1972, Bryce Fastener, Inc. of Phoenix, Arizona has been designing, manufacturing and selling custom security screws, nuts and bolts. Bryce fasteners are used extensively in the industries of solar, financial, retail, military, government, utilities, corrections and more to protect and serve a wide range of unique and demanding applications. Seven years of research and development has lead to Bryce Fastener's Key-Rex™, the most high-security screw fastener system ever made. Since nothing like this had ever been manufactured before, Bryce had to push the envelope in security screw cold heading to make the manufacturing process successful. The development of this new type of manufacturing equipment has given Bryce capabilities that far exceed any other known screw and bolt manufacturer. Bryce manufactures security fasteners as small as 2/56 (M2) to as large as 5/8-11(M16) which is the largest security screw ever made. the special safeguard feature of the Key Rex screw is the endless combination of complex shapes developed in the drive (head) of the screw. Each keyway shape and matching driver bit is licensed to only one client. Because the driver bit functions like a key, Bryce recommends that clients restrict use of the bits to authorized personnel just as they would with keys to their facility. In addition to the world famous Key Rex, Bryce has developed numerous other high-security screws, bolts and nuts such as the Penta™ security nut. 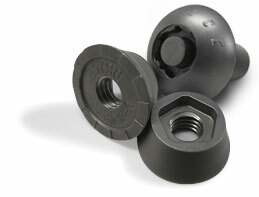 Bryce also has the ability to make a unique security nut for any application (call 1-800-558-1082 for pricing). We consider ourselves the most technologically advanced, high-security screw specialists in the world. Although manufacturing custom security screws is a difficult process, Bryce makes it cost-effective. The screws are made by a process called cold forging. Security shapes are forced into the head of the screw with up to 50 tons of pressure. The unique tamper-proof screw tooling requires experienced specialists, lots of time, and near perfect machinery, and that's where Bryce excels. Developing a new type of fastener is no easy undertaking. However, with ten years of designing, testing, trials and errors Bryce has successfully produced revolutionary security screw products that have taken security fasteners to a whole new level. Over the past century fewer than 10 styles of screws have been introduced. Some examples include the Square Drive, Phillips®, Torx®, Allen®, Tri-wing®, one way, and drilled spanner, etc. Bryce has developed several in just the last 10 years. Our Key Rex system has actually created millions of newly shaped keyways over the past 2 years alone. Other security screw manufacturers use tooling to make one style of screw head; Bryce's tooling makes millions of styles. All other security screws have one style of screw driver, Bryce has millions. Bryce keeps track of over 300 million security screw styles. Others manufacturers outsource to other countries. Bryce does everything in its own U.S. facilities. Other manufacturers make big runs, Bryce must make small runs. Most other security screws are "off the shelf" and can take 14 weeks to manufacture; we can only take 6 weeks to meet customer demands. Other screw developers can be secure in their patents. For security reasons, Bryce must be very selective in what the patents reveal. Our dedication to high security has driven Bryce to develop new tool making, manufacturing, key making, heat treating, and information processes. Bryce's research and development team as spent more than 7 years developing the most secure and innovative fasteners in the world.